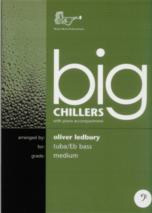 A selection of 8 Big Chillers arranged by Oliver Ledbury for tuba/Eb bass, with piano accompaniment. Medium grade, in bass clef. Titles include - One Note Samba, As Time Goes By, Mack the Knife, Lullaby of Birdland, A Nightingale Sang In Berkley Square, Night & Day, Aint Misbehavin, Fatman Blues.